NWOT - Just My Size Cotton Blend French Terry Wide Stretch Band Shorts with Front Pockets. 80%Cotton 20% Polyester, smooth jersey outside & french terry weave inside. 2" full elastic ribbed waistband. They have a casual style that pairs well with a tee shirt or a blouse. 97% cotton and 3% spandex. 2 pockets at waist. Saddle brown. length: 20". Tumble dry low. Gauze fabric. Size 4(4X). Pull-on style. Imported plus size shorts. Smocked back for the perfect fit. NWOT - Just My Size Cotton Blend French Terry Wide Stretch Band Shorts with Front Pockets. 80%Cotton 20% Polyester, smooth jersey outside & french terry weave inside. Navy With Red waistband. 2" full elastic ribbed waistband. Basic Editions Casual Shorts. 100% cotton, elastic waist with tie, front pockets. top of waist to bottom of shorts:20 1/2". Waist ( seam to seam not stretched):24". 4X 30-32 W. With small pocket on right leg. Small pocket on right leg. 2" full elastic ribbed waistband. 4" Waist not stretched out, Approx 52" stretched. Machine wash. Relaxed fit. Two Front Slash Pockets And One Small Button Pocket, Two Back Flap Button Pockets. Leg Opening: 16”. Outseam Length: 30”. 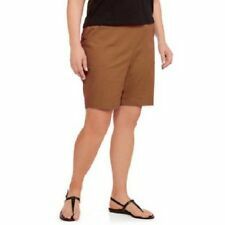 LANE BRYANT SHORTS~Nice Black and Tan print~Flat waistband with elastic at each side and a drawstring~Button and Zipper closure~Front pork chop pockets~Back patch pockets~Size: 28 (4X). SOFT 100% COTTON STRETCH KNIT GRAY PULL-UP SHORTS. Cute, Quality, Comfy, Soft! Lightweight stretch knit fabric, Pull-up elastic waisted shorts, No drawstring. SIDE SLIT POCKETS ~~~ SIZE 4X ! MAY RUN BIG MAY RUN SMALL MAY RUN JUST RIGHT. Coral Shorts are lined see last picture. Elastic on back waistband. 23" waist unstreached 20 1/2" long and rise is 15 1/2. New Lane Bryant winter white brocade floral print shorts with a light shine to them. Lined all the way in satiny polyester. Two pockets on front. Light elastic all the way across back of waistband. New Just My Size Cotton Blend Wide Band Stretch Waist Pocket Shorts 4X Red/Orng. Made of soft 97% cotton with a bit of spandex for the perfect amount of stretch, these shorts have an easy and hassle-free pull-on style, so you won't have to worry about fumbling with buttons or zippers while you're in a hurry. Lane Bryant 26/28 Floral Black Pink Plus Size Light Summer Shorts . Condition is New with tags. Shipped with USPS First Class Package. Snag up these shorts and be ready for the hot months ahead! New comfy stretch jersey style shorts, 2 pockets flat front. elastic waistband. 17" crotch rise. Torrid Black Flowy Lace Shorts Floral. Front and back pleats add flow to black lace construction that flares like a skirt with the coverage of shorts. Scalloped lace overlay. Imported plus size shorts. CATHERINES BLUE JEAN / DENIM SHORTS. MATERIAL: 51% COTTON, 25% POLYESTER, 12% RAYON, 2% SPANDEX. EMBROIDERED POCKETS. COLOR: DARK WASH BLUE. This is for your protection as well as ours.